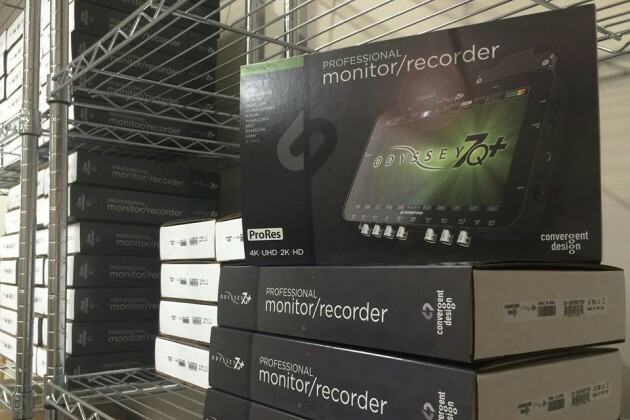 Colorado Spring, CO, USA (April 13, 2015) — Convergent Design engineers are always working to expand the capabilities of the Odyssey family of monitor/recorders. Today the company announces that Apple ProRes 4K/UHD will be possible up to 60p and 2K/HD will be possible up to 240p. The new capabilities will be available for all currently supported Apple ProRes formats, Apple ProRes 422 (HQ), Apple ProRes 422, and Apple ProRes 422 (LT). “We are pleased to provide these capabilities at no cost to our clients,” said John Schell, Hardware Design Manager, Convergent Design. “While designing the Odyssey Family of Products three years ago, Convergent Design had a vision of a comprehensive solution for monitoring and recording. This vision pushed us to design a multi-generational platform to support cameras and formats not yet developed. The capability built into the Odyssey platform from the beginning allows us to continue to unlock new cameras, formats, and features, giving our clients new tools to express their creativity. The addition of 4K60p and 2K240p Apple ProRes shows the continuing vision of the Odyssey platform.”. High frame rate material is useful both for creating slow motion material and more immersive content. Several networks and distributors are specifying 60p frame rates for UHD deliverables. Some cameras can only output higher frame rates in a RAW data format. RAW data at high frame rates consumes vast amounts of memory. Instead recording high frame rate material in Apple ProRes significantly reduces on set media needs, slashes offload times, dramatically simplifies post workflows, and shortens post schedules. The first input format scheduled to be made available with the higher frame rates are the RAW data signals from the Sony FS7 and FS700 for clients utilizing the Sony FS Record Option on the Odyssey7Q and Odyssey7Q+. This will allow the recording of 4K RAW -> 4K/UHD/2K/HD Apple ProRes up to 60p, 2K RAW -> 2K/HD Apple ProRes up to 240p, and 4K RAW Burst -> 4K/UHD Apple ProRes up to 120p (available on the FS700). The new capabilities will be made available in a free future firmware update to all users who have purchased the FS700 record option. Future support will include Canon C500/C300 MK2 4K RAW, Canon C500/C300 MK2 HD video (up to 120fps), Sony F5/F55 4K/UHD video, and others. All Apple ProRes frame rate expansions will be provided via free firmware updates. Current owners of Record Options will receive increased capabilities within their Record Options at no additional cost. 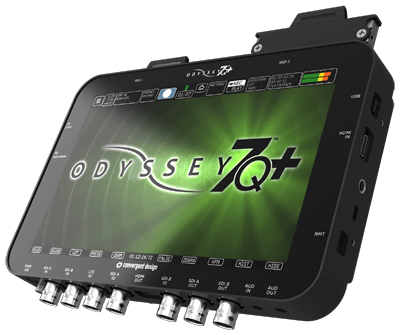 The Odyssey7Q+ is one of the most advanced, most capable, most versatile monitor/recorders in the world. The Odyssey7Q+ can record 4K/UHD/2K/HD via SDI and HDMI. It can record RAW (with Record Options), uncompressed DPX, and Apple ProRes. The Odyssey7Q+ features an OLED 1280×800 monitor with true blacks, accurate colors, extended color gamut and a 176 degree viewing angle. Along with the best image in the industry, the Odyssey7Q+ also features an extensive array of image analysis tools, including RGB waveform, RGB Histogram, False Color, Pixel Zoom with finger drag, three-mode Focus Assist and monitoring LUTs.